I recently decided that my word for the year 2017 is the Danish word “Hygge.” Loosely translated, hygge means “taking pleasure from the simple, cozy things in life and the company of friends.” That’s what I really need this year so I’ve spent the last few days compiling the best tips on making my life more hygge and coming up with a few of my own. If you want to bring more joy and coziness to your life, then these tips might be helpful to you as well. 1. Surround yourself only with things you love. Danish homes follow a minimalistic, open style. Edit your environment so you only see items that you love and have meaning when you look around your house. If it’s too cold outside to experience nature, bring a little nature into your home. Indoor plants help clean the air in your home and flowers always provide a decorative bright spot. Does anything add more magic to a room than twinkling fairy lights? Keep the holiday spirit alive until spring! The bath is one area where you don’t need to be minimalistic. Surround yourself with everything you need for the ultimate restorative bath. I was a big fan of lighting a candle to make things more cozy even before I embraced hygge, but now I know the joy of lighting multiple candles, dimming the lights and letting the multiple scents drift the house. Heaven! 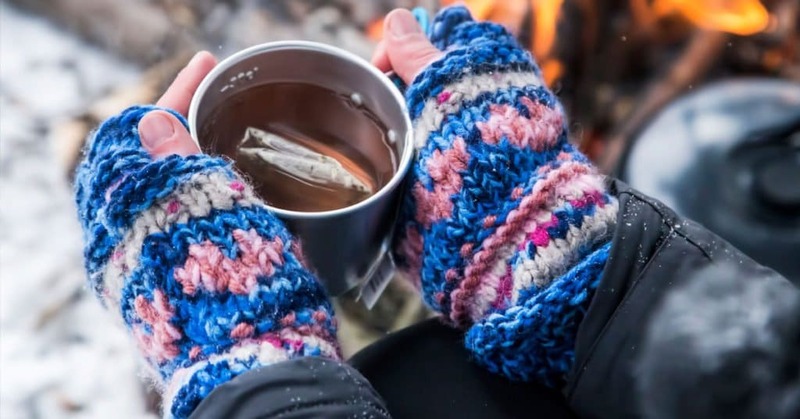 Hot drinks like tea, mulled wine, or cocoa are always hygge. You can’t gulp them because you’ll burn your tongue so you’re absolutely forced to slow down and savor the moment. To be fully hygge, you shouldn’t just pour a powdered mix into your hot water. Instead, take some time to make some truly gourmet homemade hot chocolate and you’ll never go back to the instant. Baking requires you to slow down and pay attention or things can go horribly wrong. The Danish enjoy making their own sourdough rye bread, which takes at least two days to make. And what could be cozier than a selection of amazing Bundt cakes? I’ve got to get this Pine Forest Bundt Pan! Is there anything cozier than a big batch of soup bubbling on the stove? This Danish Split Pea Soup will fill your house with wonderful smells while it cooks and makes a wonderful simple dinner paired with the sourdough rye bread. Hygge is all about convivial experiences with friends. But you don’t want to be stressed out with too much work to prepare for entertaining. Instead, invite your friends over for a potluck dinner and enjoy the easy community. Break out some board games and invite the gang over for an evening of friendly competition. Spending time at home with friends is way better than hanging out in some noisy bar. The Swedes have a saying, “There is no bad weather, only bad clothing.” Even if the weather isn’t ideal, you can still get out and enjoy nature. Just bundle up appropriately! Skating on an outdoor rink can’t be beat as a hyggeligt actvitiy but indoor rinks can provide tons of fun as well. Another great activity to share with friends! I can’t think of anything more Nordic than relaxing in a sauna. I don’t know if you really sweat out toxins, but it sure feels like it and you’ll walk out refreshed and relaxed. No home sauna or access to one through your gym? See if your town has a spa with sauna access and book a massage as well! I can tell you from experience how cozy and satisfying it is to go for a swim in an indoor pool on a rainy afternoon. My kids and I used to pop over to an indoor public pool near our house on Sunday afternoons. The pool was housed in basically a giant greenhouse so you could see the world outside while you swam. On rainy days, you could float around the pool’s tiny lazy river and feel like nothing would ever touch you. Some of my happiest times are on Sunday mornings. I’ll cook a big breakfast while my husband puts a record we love on the record player. There’s something warm and immediate about the sound that you can only get from vinyl. If you have a fireplace, by all means, use it! An outside fire pit is also very hyggeligt. Just take your candles and your drink and plop yourself in front of it. If you don’t have access to a fireplace, perhaps there is a cozy bar or coffeehouse nearby with a comfy chair just waiting for you. Kindling ✔️ ✔️✔️ All stocked up, fire burning, blanket & cocoa standing by! Staying warm inside on this sunny 15° Pacific NW day! Anyone else getting cozy? Stay warm this weekend my friends! Perhaps the best hygge experience is to spend the evening snuggled in with a loved one (or alone) and a good book. 18. Netflix and Chill with takeout and a loved one. Protip: The loved one is optional, but the takeout is absolutely mandatory. Maybe the Danish are one of the happiest cultures on earth because they don’t admire the seventy hour work week the way Americans do. When their 4:00 p.m. quitting time (I know!) rolls around, they leave to get on with the rest of their day. Why not schedule the activity that’s most important to you on your work calendar as an important appointment and see if the world stops when you leave? I still resent my daughter for taking the fur throw I bought for my self-care kit off to college with her. She says she loves it, though, and I’ve finally replaced it with this one for me. I can speak as an expert when I say that cuddling under a fur throw is the coziest feeling ever. I can’t believe I waited so long to replace my previous throw; it was an essential component for waiting out my regular midnight insomnia and I’ve missed it so much. To embrace hygge properly, you’re going to need to drink a lot of hot drinks. Make sure your mug gives you pleasure. You can’t feel hyggelig in pants with a waistband. I recently purchased these yoga pants from Amazon and I can tell you that they are the literal best. They have pockets! Pockets! Pockets! You can go out without a purse and not make someone else have to carry your phone! Athleta leggings also have pockets, but they’re a little expensive for me. At any rate, you must be comfortable in your pants and able to eat vast quantities of danish pastries without discomfort. Ok, I know that Uggs are played out and not even Danish, but I recently broke down after 15 years and bought a real pair of Uggs and my life has been forever transformed. Every time I put them on (and I put them on pretty much every morning now), I moan a little about the soft, warm happiness I’m letting my feet experience. I know I’m probably the last person on earth to get a pair, but if you haven’t yet, think about it. Your feet will thank you! I’ve been soothing myself to sleep each night with a variety of books about the hygge lifestyle. I’ve had a mild cold for the past week and I’m feeling very low-energy so looking at pictures of people indulging in comforting activities has been a fantastic tonic. I’m getting the rest I need while looking at pictures of other people cuddling cats and downing hot tea. Seeing all these folks relax has been giving me permission to do the same. My favorite so far is How to Hygge: The Nordic Secrets to a Happy Life, which is filled with pictures of attractive people in attractive settings and includes delicious-looking recipes which I’ll try as soon as I feel up to dirtying the kitchen again. Next up for me is The Little Book of Hygge. This book isn’t available in the US until January 17 but the Instagram community seems wild for it so I can’t wait.